Welcome to RALEIGH-DURHAM Heating & Air Conditioning. We are ready to provide Air Conditioning & Heating service or HVAC installation for your home. 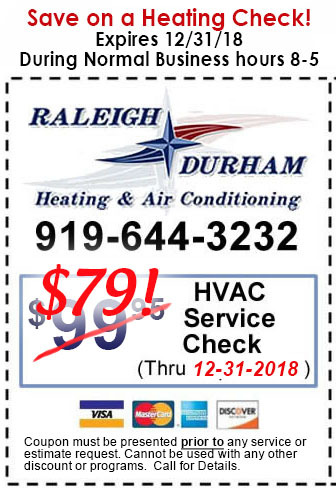 Our company maintains, services, replaces, and installs heating and air conditioning systems throughout residences in the greater Durham/Chapel Hill area. We service Durham, Orange and Alamance Counties in NC, including Durham, Chapel Hill, Roxboro, Efland, Mebane, and Hillsborough. Since 1995 our family-owned company has been helping residential customers stay comfortable in our hot Southern summers and our increasingly cold winters. Our products help reduce energy consumption while allowing our customers to breathe healthier air; all within their budget constraints and on time according to their busy schedules. We are proud members of ACDoctor online - we help keep your HVAC unit healthy to help you stay comfortable.